Lucy and her parents spend a long, fun day at the beach. They all yawn as they head home for an early bedtime. As her mom reads a bedtime story, Lucy drifts off. But later, she awakens in a dark, still room, and everything looks mysterious. How will she ever get back to sleep? 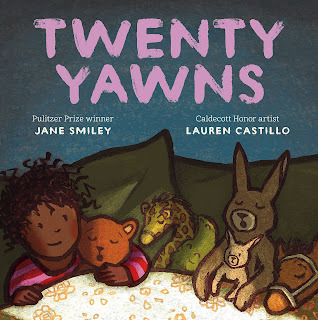 Yes, there are actually twenty yawns to count in this book. Which, I mean, is a nice added bonus to a bedtime book—it's a counting book, too! And yes, the story will in fact make you sleepy; it's nearly impossible to read about twenty different yawns without you yourself yawning. Also, the illustrations are perfect—all soft and cuddly with Castillo's signature thick outlines and softly textured colors. Really, forget counting sheep, use this book to get your child to sleep! Now I didn't give it quite as many stars because the story itself is not my favorite. While Smiley is a very well-respected novelist and writer, this is her first picture book, and that shows. Referring to moonlight as "a silver veil," some of the vocabulary choices, and lots of details add a bit of a too-mature voice to the story. This, of course, is personal opinion and I'm sure there will be plenty who appreciate this fact. Overall, like I said, it's still a good bedtime story and I'd recommend it.